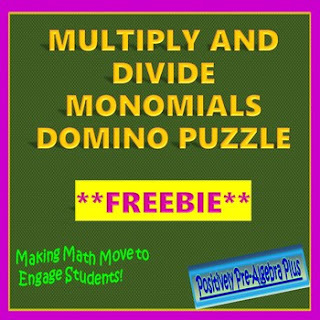 This is a fun freebie, and one that I hope you and your students will enjoy. This puzzle covers multiplying and dividing monomials and I first used this as a “row race” activity a few days after the initial lesson. Students partnered up and competed to be the first team to finish. Talk about 100% effort and participation! I also use these types of puzzles in my “early finishers” station and as warm-ups that act as spiral reviews. These puzzles are always a hit with my kids and I hope they are just as popular with yours! Thank you for downloading this product. Please let me know how it worked for you by visiting my store again and leaving some feedback. I welcome all comments and suggestions so I can create items that are truly useful in your classroom.